It’s the perfect way to spend a rainy night with your family. 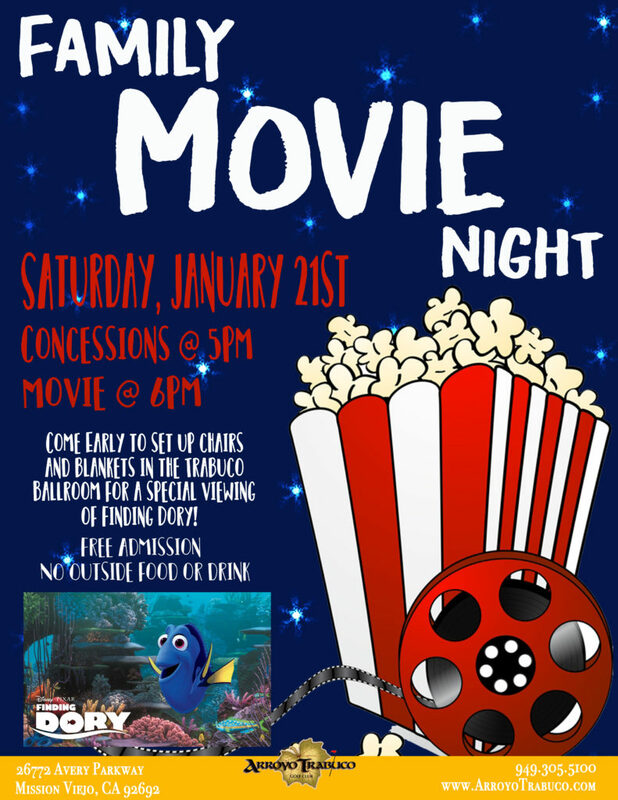 We invite you and your family to join us this Saturday in the Trabuco Ballroom for Family Movie Night. Free Admission. Come anytime after 4pm to set up chairs or blankets and get settled in for fun and entertainment. Saturday’s Feature will be Finding Dory. It is funny, adventured-filled and heartwarming. The sequel to Finding Nemo, it has everyone’s favorite characters from the original and some interesting new faces. The movie starts at 6 o’clock. We will have concessions available starting at 5PM including popcorn, candy, soda, hot dogs, and personal pizzas. Bring some chairs and blankets and settle in the ballroom for snacks, fun, and entertainment. Posted in Save Money, Special Events.